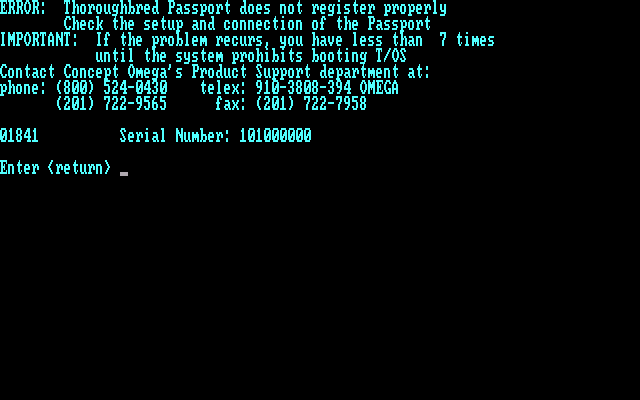 Originally released in 1983 by Science Management Corporation and later under Concept Omega Corporation, Thoroughbred/OS is a unique BASIC oriented multi-tasking multi-user operating system for the IBM XT and compatible systems. and the shell itself is an interactive basic interpreter. Most computers these days are just an empty box without an operating system. 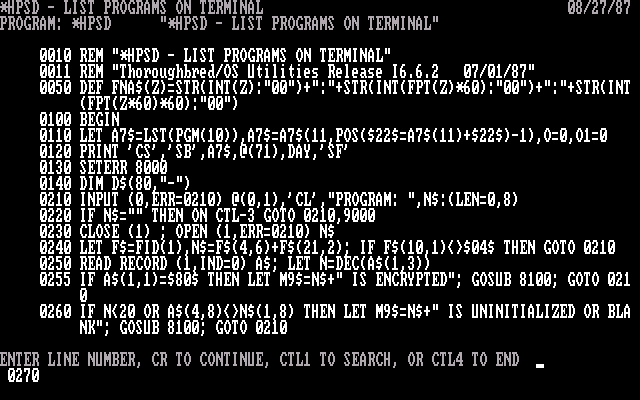 But early microcomputers would often start up to BASIC in ROM, and by extending available command, BASIC would sometimes double as a command "shell". 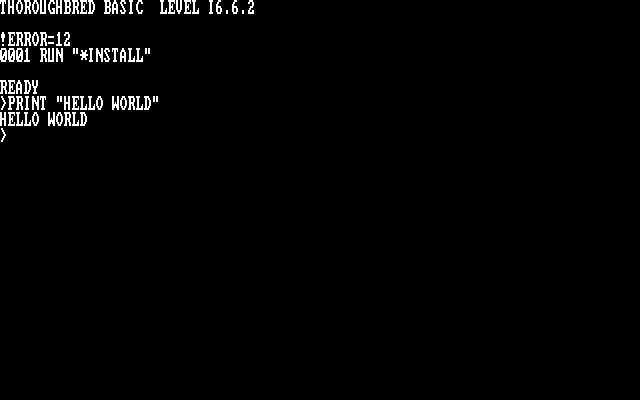 For example, loading Applesoft DOS on an Apple II would give you ROM BASIC but with access to disk commands. Thoroughbred/OS sort of mirrors that way of doing things. Thoroughbred/OS seems to qualify as a full blown, although somewhat primitive, operating system. It supports multi-tasking, multiple users, background processes, several high-end serial expansion devices, and supports a variety of terminal types. All applications that run under this system must be written and stored in Thoroughbred's BASIC. While this means it does NOT support DOS programs, this ensures that all applications are well-behaved and capable of running in a multi-user environment. It uses its own proprietary and unusual file system. It is neither DOS nor anything else. 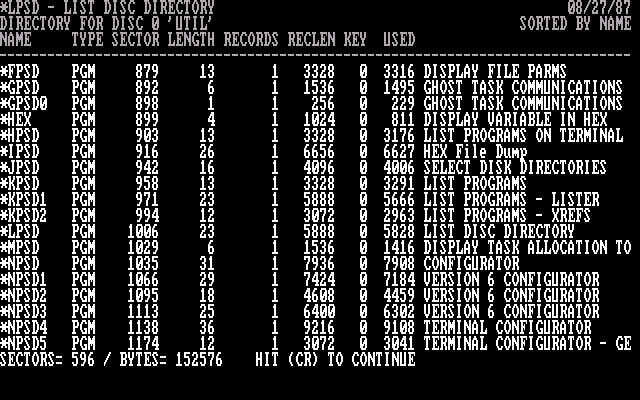 The Thoroughbred/OS file system supports "directories". But they are not hierarchical and only up to 10 are "accessible" across all drives at any given time. Reconfiguring what directories are available is sort of like choosing drives to mount, and requires a reboot. You must manually specify how many maximum files each directory may hold. That is even weirder than CP/M's "user areas". It supports read and write file buffering. This version supports the IBM AT and use of 360k, 720k, 1.2mb, and 1.44mb floppy disks. 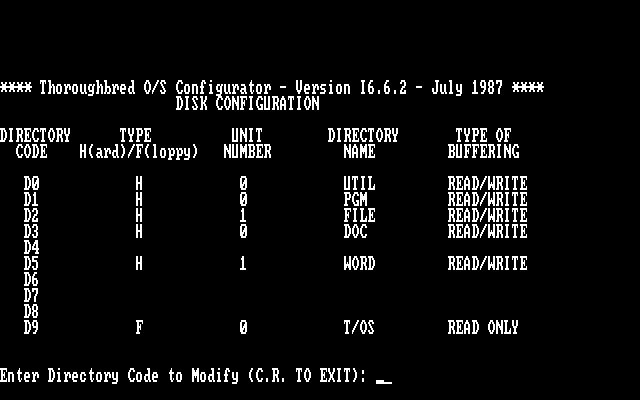 It also supports a tape backup device, and even contains a disk defragmentation tool. I'm not sure if the underlying OS is directly or indirectly based on anything else. It looks very unique in all regards. The installation requires a hard disk drive. It expects a standard IBM XT 10-megabyte hard drive, but can work with others. Thoroughbred/OS requires its own partition for its propriety file system. The setup is rather complicated, but this archive thankfully includes the manuals. An annoyance is that Thoroughbred/OS is copy protected. It requires a serial dongle called the "Thoroughbred Passport". Without this dongle you are only allowed to start the OS seven times before it refuses. 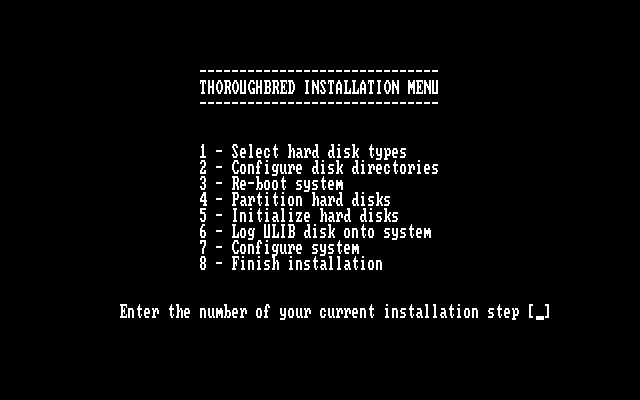 And you will need several reboots just for installation. Of course, with an emulator you can just revert the image. Interestingly it seems that Thoroughbred/OS was supported for quite some time, well in to the era where most other non-DOS compatible IBM PC OSes had died off. A separate product, "Thoroughbred BASIC" was available for DOS, Unix, and VMS. Although I am not sure, it seems unlikely the DOS product offered any multi-tasking capabilities. So, in conclusion, this is a very unique little operating system for 8088/8086 based PCs. woo, record based file systems! What market niche ws this built for? IOW, the OS /is/ the database. Tailored for libraries/inventory or POS systems? That is a good question, it seemed fairly general purpose. Originally I was thinking industrial automation, but you usually would not need multitasking or terminals for that. So probably, yes small custom multi-user databases or financial/scientific calculation programs. In the very early to mid 80s, it was very common for people to try and take an "inexpensive" IBM PC or clone, and connect a number of existing or inexpensive dumb terminals to it. That would save the money of having multiple PCs, eliminate the need for networking which was still new, and move away from expensive mainframes or time sharing systems. But in this case, a system using Thoroughbred/OS would have to be dedicated to a single purpose. Yes, very database oriented, and there would be no way to run general productivity applications. I bought a Tandy CoCo 2nd hand at a fleamarket. I started hanging with a fella that did S-100, that also dinked with the CoCo. He got me into OS-9. The very first thing I did was write some softs so I could run 4 beat up old VT-100 terms. I thought it was the future of computing - 4 users all at once tied into a central cpu. WoW was my head huge. I used to work on these systems. The company I worked for sold an accounting package called Maxwell Systems that ran on Thoroughbred BASIC. It was for the construction industry and included modules for all your basic cost accounting needs plus service management. We had a couple of customers that ran T/OS on x86 Altos boxes (man, those things were built like tanks). Interesting stuff and I never thought I'd ever see anything about it again, but was recently reminded about it due to a friend working on some business BASIC stuff and having questions for me. A search brought me here. Thanks for posting about it. A definte trip down memory lane for me. Hi! Has anyone tried it in MAME? I have the dumbest problem: once the installation disk boots, it display the serial dongle message and waits for a press, but I just can't pass that, I think it is a keyboard mapping problem. Anyone had that?